After using the Salomon Advanced Skin S-Lab 12 Set pack for several months now, I feel it’s time for a review. I bought it back in January(?) and I’ve worn it for 20 hours doing R2R2R, at the Treviso marathon, (I know that’s weird), Hell’s Hills 50 Miler, and dozens of multi hour training runs. It’s gotten to the point that I feel weird if I run without it. Bottom line: I really like the pack. First and foremost: fit and comfort. For me, the pack fits beautifully. It’s like wearing a vest vs carrying a “backpack.” That is a huge difference. The vest style design eliminates the sore shoulders that result from a backpack style pack. At my last race, even after 9 hours, my shoulders felt fine. There is more surface area than most other packs, which means more pockets and places to stash things. This increased surface area helps distribute weight. The elastic material along the outer edge pulls the pack load closer to your body. This helps the pack stay put and keeps stuff from bouncing around. And one of the things I like best is there aren’t any loose strap ends flapping about. It comes with two 16 oz soft flasks, but get this – IT DOES NOT COME WITH A BLADDER. (Yet it does come with an insulated sleeve for a bladder.) 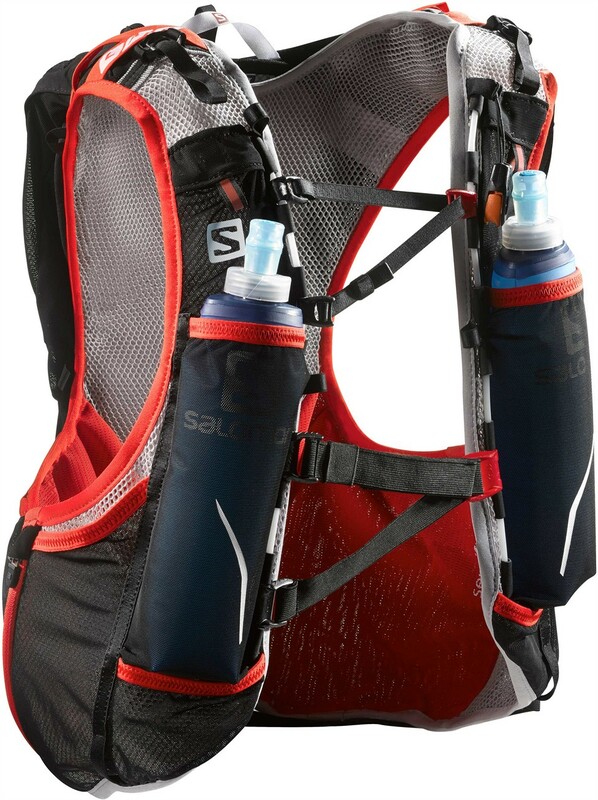 This really confused the heck out of me, why sell a hydration pack without a bladder? So I bought a Camelbak 2L bladder. I filled it with water and tried to put it in the insulated sleeve… It wouldn’t fit. I believe the sleeve is made for a 1.5L bladder. Not the end of the world, just throw the bladder in the pack without the sleeve. Then I ran into another snafu. 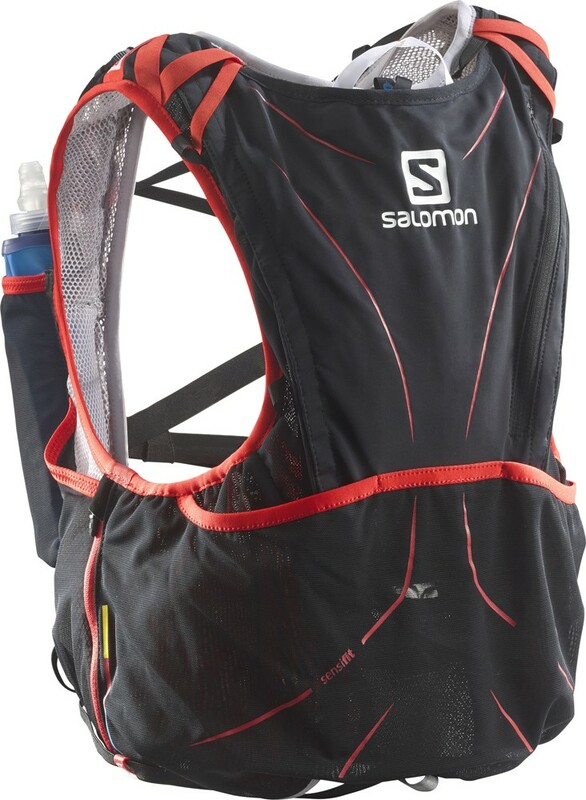 Some official looking photos (not on the Salomon website) show the hydration tube running out the “tail” and under the vest. However this requires a bladder with a spigot that routes sideways rather than upwards. Again, not the end of the world, just route the tube over the shoulder. It was at this point I wished the pack had come with “instructions” or a small guide. (There’s a small illustration for how to secure trekking poles, but that’s it. ) Or better yet, these details made clear on the website. That way I could have known to buy a 1.5L bladder with a sideways spigot. There are pockets galore! It’s a little overwhelming at first what to do with them all, but eventually you’ll figure out your system. Most of the pockets are easy to get at. The zippered pocket on the side opens easily with one hand, but you need another hand to hold the bottom of the zipper to zip it up. No big deal. The big open rear pocket is tricky to get into without taking off the pack. And although it feels sketchy to have the rear pocket secured only by the tension of the elastic, I’ve yet to have anything fall out on during a run. Lately I’ve been running during the hotter parts of day. The pack is constructed with mesh material and breathes well. However, sweat easily migrates through the mesh, so make sure whatever you carry in those pockets is sweat tolerant. If you carry your phone, you would be wise to keep it in a Ziploc baggie. The evaporated sweat also leaves a visible salt residue which is a visual reminder that the pack needs to be washed. At $185, (WITHOUT a bladder) I cried when I bought this, however it has been worth every penny. REI recently started carrying the pack, so if you’re a member you’d get $18.50 back on your dividend. Finally, the name is in desperate need of shortening or simplifying. Salomon Advanced Skin S-Lab 12 Set just does not roll off the tongue easily. Or at all. Someone asked me about the pack and I couldn’t remember the name. Maybe Salomon can work on the name for the next version.